The Water Level Form (referred to in EDGE as WL Form) provides a user-configured custom form for data that would otherwise be collected in the Water Levels tab, and which populates the WaterLevel_v1 section of the EDGE EDD. The Water Level Form may be made visible using the “Show/Hide Tabs” item on the EDGE Menu, as explained in the Data Tab Chooser. 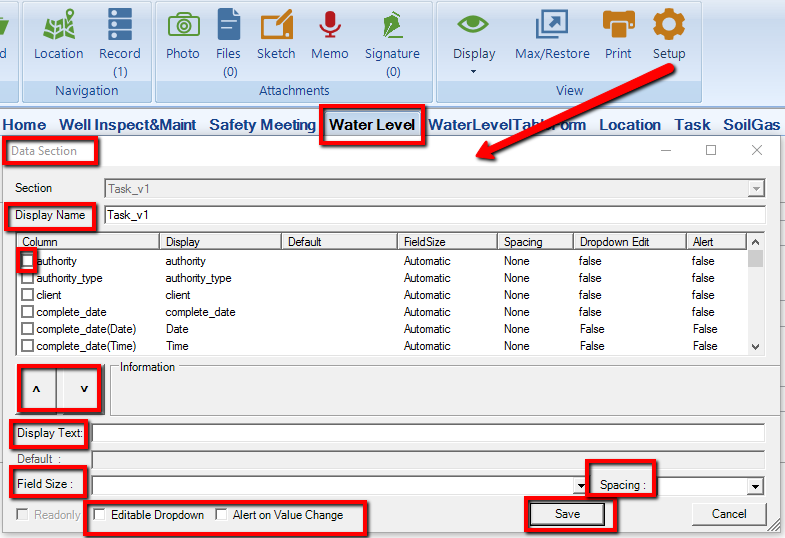 Click "Edit" to configure which water level data fields display. A "Data Section" window will appear which gives the user the ability to show, hide, caption or rearrange the data fields. •Check box - toggle to make a field visible/invisible. •Up/down arrows - to reorder the fields, highlight the required field and click the appropriate arrow until the desired layout is achieved. •Display Text - user friendly name for the selected field. •Save - click to save changes and return to the form. The user may optionally add in activity sections such as Well Inspection items, that would normally be recorded in either the Activities data tab or the EDGE Activity Form. Setup of these activity sections is identical to that of the Activity Form, more details are available in the Activity Form. Signature Panes can be added to the form using the Sign button in the Form tab. More details are available in Attaching Signatures. 1.Select a Task from the Task Chooser and a Location from the Location Chooser. 2.To add a new water levels record, click New. To create another instance of the form for the same location, click New again. Note that two instances of the form cannot exist at the same date, time, and location, as these values help differentiate record uniqueness in the WaterLevel_v1 section of the EDGE EDD. To navigate among instances of the form at a particular Location, select Record located in the Form tab on the top of your screen. The Water Level Form may be customized with a logo. For further information click on Form Logos. The user may increase/decrease the size of the font by going to the options in the Form Tab, and selecting Font. The water_level_elev is a calculation of historical_ref_elev and depth_to_water. 1.An enumeration "water_level_elevation_clearing" determines whether or not the water_level_elev will clear upon deletion of depth_to_water. 2.If the enumeration is set to "Y", when the depth_to_water or historical_ref_elev field is cleared, the water_level_elev field is also cleared. 3.If the enumeration is set to "N", when the depth_to_water or historical_ref_elev field is cleared, the water_level_elev will not clear. 1.EDGE will calculate the elevation differently, depending on what the waterlevel_v1.dip_or_elevation is set to. a.If it is set waterlevel_v1.dip_or_elevation = "elevation"
1.The water level general section will copy over the data in its fields when a new record is created. a.For example, if the Technician field had "John Smith" filled in, and then the user creates a new record, it will still contain John Smith in the new record. b.Some fields are populated by default as soon as the record is created, such as date, and may be different than the previous record. 2.Error Flag Refreshing: An additional feature was added to the Water Level Form, named Error Flag Refreshing. Entering data in a field will flag errors on other fields. The flags become visible immediately (either when changing or exiting the control) with no need to refresh the form.